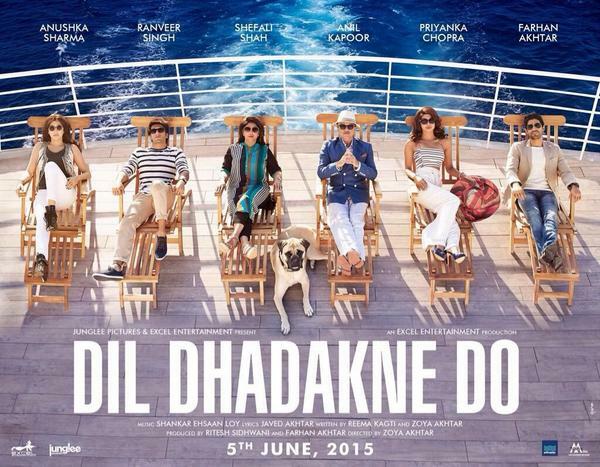 Don't kill me pls - Dil Dhadakne Do! Dil Dhadakne Do can be very well compared to buffet spread of Chutney Chang, which has 108 dishes but none of it looks appealing to you. Instead of complementing each other, as a matter of fact, they rather confuse you. Zoya Akhtar - How many people you wanted to stuff in a single movie! What was the point of playing passing the parcel with camera? Couldn't you have chosen 4-5 characters and tell a compelling story with them. We have seen enough of Kekta Kapoor on TV, don't need to replicate it on silver screen. Entire story (whatever little it is) is narrated by Pluto Doggy Mehra that how each character thinks and behaves. Sometimes, you'll feel as if you are watching a Discovery program on "Human Psychology and Social Behavior as experienced by canines". Right from Anil Kapoor to Ranveer Singh to Farhan Akhtar to Priyanka Chopra, every single character a loser in the film. Everyone's marriage is falling apart. Everyone is helpless. Acting of every character is utter crap. Ranveer Desperate Singh, Anil Jackass Kapoor, Priyanka Piggy Chops, Anushka swollen lips Sharma - Shame on you for such dismal performance. Shefali Shah was the only saving grace and she managed to exude vivid emotions with excellence, amidst bunch of hopeless nincompoops. Aamir Khan gave voice to Pluto Doggy Mehra. To some extent his narrative managed to sew loose pieces of incidents together in a chronological order. But he said "Dil" so many times, I am sure he must have blurted out "Dil Ki Deal, Snapdeal" a zillion times in rehearsal. Farhan Akhtar was quite capable to pull off entire film single handedly but his entry was post interval. It is like giving last 5 overs to AB Devillers and expecting him to hit a century! There was no editing done for the film. How could you stretch this baseless banter to 170 minutes? Unbelievable! Soundtrack of the film is boring and none of the songs are catchy. Shankar Ehsaan Loy have disappointed us this time. There is an interesting trivia about song "Pehli Baar". This song didn't use any choreographer. Director asked Ranveer & Anushka to do it impromptu, so that their sizzling chemistry could be seen onscreen. Well, I could only see their incapability loud and clear. Verdict: Please spare yourself this torture and bless me for sacrificing my evening and warning you in advance.